Tiny structures found in 3.4bn-year-old sandstones in Western Australia represent some of the oldest, best preserved evidence of life on Earth. Scientists say their analysis of the microfossils clearly shows the organisms were processing sulphur for energy and growth - not oxygen. They report their discovery in the journal Nature Geoscience. The team says the microbe remains offer a fascinating insight into conditions on the ancient Earth. "At last we have good solid evidence for life over 3.4 billion years ago. It confirms there were bacteria at this time, living without oxygen," said co-researcher Professor Martin Brasier at Oxford University, UK. "Such bacteria are still common today. Sulphur bacteria are found in smelly ditches, soil, hot springs, hydrothermal vents - anywhere where there's little free oxygen and they can live off organic matter," he explained. 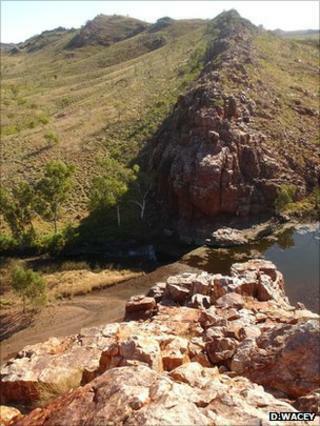 The fossils were first identified in 2007 at Strelley Pool, a remote location of the Pilbara, a dry region about 60km west of Marble Bar. Their host sandstones were laid down in what would have been a shallow-water beach or estuary. They measure just a few millionths of a metre (microns) across and have been subjected in recent years to a series of advanced analytical techniques to probe their origin. The scientists say they are now confident that the spheroidal and ellipsoidal forms buried in the rock are the remains of bacterial cells, along with the protective tubes that once housed them. Form and behaviour are good indicators. The shape and clustering are reminiscent of bacterial cells. But more than that, the fossils are associated with tiny crystals of "fool's gold" - the pyrite mineral composed of iron and sulphur. The types of atoms, or isotopes, present in these crystals point to the pyrite being formed as a by-product of cellular metabolism based on compounds of sulphur. "Life likes lighter isotopes, so if you have a light signature in these minerals then it looks biological," said lead author Dr David Wacey from the University of Western Australia. "There are ways to get the same signature without biology, but that generally requires very high temperatures. So when you put together the light isotope signature with the fact that the pyrite is right next to the microfossils - just a couple of microns away - then it really does look like there was a whole sulphur ecosystem there," he told BBC News. At the time these microbes flourished, the Earth was an extreme place. It would have been very warm, with the water temperature of the oceans perhaps as high as 60-70C. There would have been few large landmasses, and circulating currents would have been very strong. The atmosphere would probably have been rich in carbon dioxide and methane, and so the ability to "breathe" something other than oxygen would have been a major requirement for any organism. Processing sulphur would have been one route to success. The Strelley Pool fossils are not the oldest claim for life on Earth. Some researchers argue that rocks at Isua in Greenland show the imprint of life at least 3.75 billion years ago. Back then, the sediments that gave rise to these rocks were also submerged. Thin layers of black sediment, separated by distinct layers of volcanic ash, look like they could be composed of the debris of ocean-dwelling microbes. There are no fossil forms, but the nature of the carbon is consistent with the idea that it was processed by living organisms. It is a controversial claim, however. Researchers are keen to trace the story of the first microbes on Earth, partly because it should provide clues in the hunt for possible life elsewhere in the Solar System. A region of Mars' Northern Hemisphere known as Nili Fossae has been described - from orbital images, at least - as a "dead ringer" for Australia's Pilbara. It has a huge abundance of clay minerals, which are formed in the presence of water. For a while, Nili Fossae was a candidate landing site for the US space agency's Curiosity-Mars Science Laboratory rover, due to launch in November. The location was eventually dropped in favour of Gale Crater, another site with abundant exposures of clay minerals. The Pilbara study has demonstrated though just how difficult it is to identify ancient lifeforms, and proving the existence of fossil microbes on another planet is going to be extremely challenging. "Some of the instruments we used can fill a whole room, but some of them can be miniaturised," said Dr Wacey. "A rover could narrow down the targets but then you'd really have to bring samples back to Earth to study them in detail."